In an outpouring of opposition to US President Donald Trump and in defence of immigrants, refugees and asylum seekers, thousands of people attended protests Monday throughout the UK. Denunciations of Trump and British Prime Minister Theresa May for their Islamophobia were central to the protests. Protestors were overwhelming young. A numbers considered themselves socialists and supporters of Labour leader Jeremy Corbyn. As well as opposition to Trump—and May’s moves to consolidate a close relationship with his administration—the protests reflected growing hostility to the whipping up of noxious anti-immigrant sentiment and xenophobia, which was accelerated during last year’s Brexit referendum campaign. There was a stark contrast between the genuine and heartfelt response of the protesters and that of the organisers of the demonstration—whose opposition to Trump is that he is pursuing policies antithetical to the interests of British imperialism. Representatives of the pro-European Union faction of the ruling elite used the protests to oppose the UK allying itself with the US and to instead form a “progressive alliance” in support of an orientation to “civilised” Europe—above all the French and German governments—against Trump. This was exemplified by the platform at the London demonstration. Owen Jones, a leading advocate of the Remain in the EU campaign and a pivotal figure in the Labour right-wing’s attempt to remove Corbyn following last year’s referendum vote to leave the EU, convened the rally. The main speakers included former Labour leader Ed Miliband and Liberal Democrat leader Tim Farron. The Liberals are set to vote against the triggering of Article 50—the means by which Britain’s EU exit begins—and are demanding a second referendum. Despite his belated calls for May to cancel her invitation to Trump for a state visit to the UK this year, Corbyn absented himself from the London demo and instead sent close ally Diane Abbott. Socialist Equality Party campaigners distributed the WSWS perspective, The Trump-Bannon government: Rule by decree, and explained that opposition to Trump must be combined with opposition to the Remain faction of the bourgeoisie in the UK and to the European powers. It must be centred on the mobilisation of the working class, in the US, Europe and internationally. Despite having just one day’s notice, tens of thousands people converged on the prime minister’s Downing Street residence. 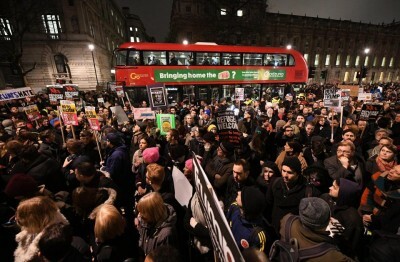 By 7 p.m., the crowd stretched the length of Whitehall and drowned out the official speakers as they shouted anti-Trump and pro-immigration chants. Many thousands took part in demonstrations in around 35 UK locations. Several thousand protested in Britain’s major towns and cities including Birmingham, Edinburgh, Glasgow, Aberdeen, Cardiff, Manchester, Leeds, Sheffield, Brighton, Newcastle and Liverpool. Official figures for the Sheffield demonstration were at 2,000, but the crowd was probably double that. Speaking at the rally was former Green Party leader and “progressive alliance” advocate Natalie Bennett, who plans to contest the Sheffield Central constituency at the next general election. Bennett demanded that the British government emulate Germany and France, which she claimed were standing up against Trump. “Germany, well done,” she told the crowd, praising Chancellor Angela Merkel. “France is resisting too,” she claimed, as was the Canadian Prime Minister Justin Trudeau. They were setting an example to Theresa May, who lacks a “moral compass,” she asserted. Bennett also claimed that the United Nations was a source of opposition to Trump’s anti-democratic actions. A Liberal Democrat councillor said that his party were united with the Greens and Labour in their opposition to Trump. “We have no disagreements on this issue,” he said. “We stand together.” Calling for opposition to Trump’s state visit, he said, “I am proud of Her Majesty the Queen and she will be put in a very bad position” if Trump is allowed to visit. The only speaker that drew a comparison between Trump’s policies and those being implemented in Britain was a representative of the Sheffield Asylum and Refugee group. His group had dealt with May as home secretary and as prime minister, “and her own policies are very much like Trump’s,” he explained. He drew attention to policies of the British and European governments against migrants trying to enter the EU. Rescue ships had been withdrawn from the Mediterranean and Aegean Seas, he explained. This was a policy “to let them drown to deter other asylum seekers. As a result, 5,000 men, women and children died last year alone” in those waters. Ahead of the demonstrations, Foreign Secretary Boris Johnson was asked in Parliament to clarify whether UK citizens and dual nationals would be impacted by the ban, in an emergency debate requested by Ed Miliband. It became an occasion for denouncing the May government for extending uncritical support to Trump and calling for his planned state visit in the summer to be cancelled. A petition urging that Donald Trump “should be allowed to enter the UK in his capacity as head of the US Government, but he should not be invited to make an official State Visit because it would cause embarrassment to Her Majesty the Queen,” had secured in excess of 1.7 million signatures by Tuesday evening.